This memory just happened, and I had to capture it for Chronospots. Let me set the stage, Patty is 18 and I am 21. I am working for my brother-in-law, Bob Moody, moving houses and I’m living with Bob and Millie at their house on Riverview Street, on the south side of Hendricks Park hill. Patty is working at the Cannery and part-time for the Arctic Circle drive-in restaurant and washing cars on the weekend. Goes without saying that we were both exhausted all the time and were constantly falling asleep on our dates. Waking up at the Motor Vue Drive-In at 2AM the only car in the lot comes to mind. Anyway, Bob and Millie invited us out with them and they took us to the Laurelwood Golf Club where they knew the guy who ran the place for dinner. The manager was a friend of Bob and Millie and a devotee of Robert Service and he entertained us in the bar with renditions of The Cremation of Sam McGee and the Ballad of Salvation Sam and other poems before dinner. Then we went in the dining room and had a wonderful dinner with after-dinner drinks, a King Alphonse I believe, which I surreptitiously shared with Patty. There was a dance band and it was a dream date which Patty and I didn’t want to end but end it did with Millie and Bob taking us back to their house. Millie and Bob left us alone and went to bed and Patty and I sat on the couch promptly succumbed to our narcoleptic tendencies. Well, we ran out of the house and jumped in the car and tore out of there and went to Patty’s brothers place where Patty was staying. They’re having breakfast and it’s up to me to explain to Freddy why we stayed out all night and he’s smirking at me. While I’m trying to convince him that Patty’s honor is intact, who should show up but Opie, Patty’s mother. She wants to know why Patty is in heels and an evening dress at the time of the morning. Meanwhile I’m trying to blend in with the drapes. I really can’t remember anything beyond that point, I don’t remember Opie ever noticing me, but I know she must have. This entry was posted on August 19, 2018 at 6:44 am and is filed under Family. You can subscribe via RSS 2.0 feed to this post's comments. You can comment below, or link to this permanent URL from your own site. 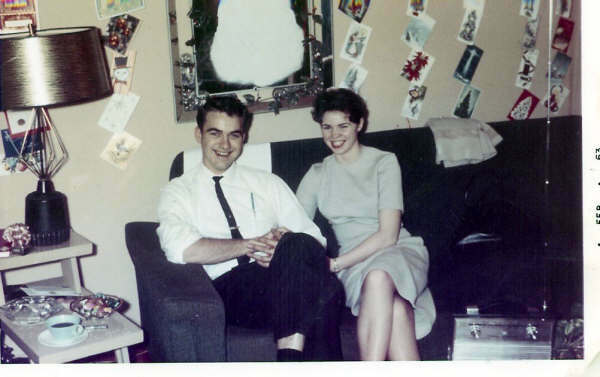 You were married in 1962, so when was this memorable night? I’m too lazy to do the math from your ages at the time. John H.